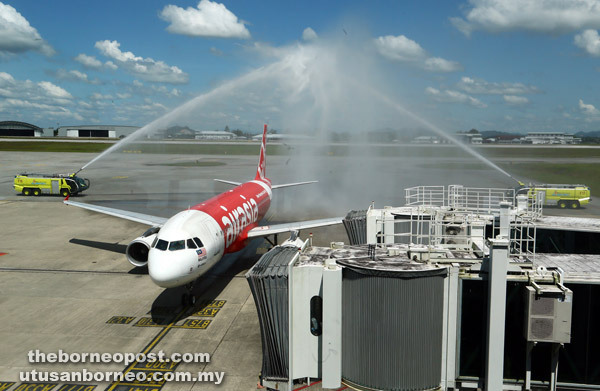 KUCHING: AirAsia celebrated its inaugural flight from Pontianak, Indonesia to Kuching with the arrival of its plane at Kuching International Airport (KIA) at 1.50pm yesterday. The plane was greeted with a ceremonial two-hose ‘water salute’ while taxiing into the parking apron and as passengers disembarked, Tourism, Arts, Culture, Youth and Sports Minister Datuk Abdul Karim Rahman Hamzah alongside Assistant Minister of Tourism, Arts and Culture Datuk Lee Kim Shin and AirAsia Berhad chief executive officer Aireen Omar were on hand to welcome and present them with ethnic motif scarves as well as goodie bags. 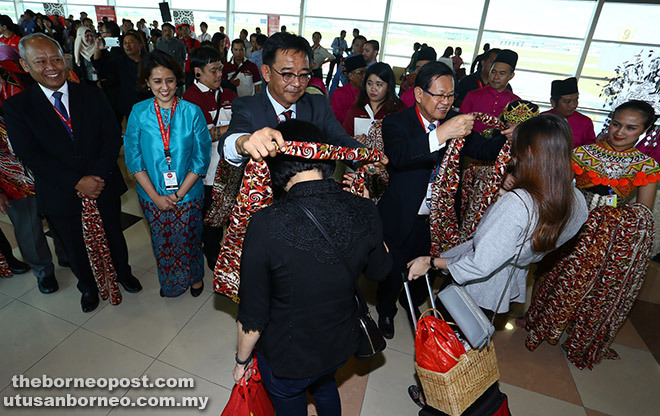 Abdul Karim described the direct flight as another milestone in the development of tourism in Sarawak as connectivity served as one of the state government’s prime areas of concern in the industry circle. “I have just returned from Guangzhou, China and the feedback I received from the industry players there was that direct air connectivity into Sarawak is the major critical success factor if we want to put tourism as our main contribution towards our economy,” he said in his speech. He added that the addition of the Kuching-Pontianak route, with seven times weekly direct flights, is indeed a boost for the state which looked forward to more connected and services routes between Kuching and Pontianak as the segment of its medical tourism as well as connecting flights are set to grow and expand. Abdul Karim also noted that as a reciprocal initiative, the state government will work together with AirAsia to develop this route and that the Sarawak Tourism Board (STB) is currently working together with the AirAsia team on several promotional activities to excite the market and to help sustain the flights focusing on Pontianak and beyond. “We are also hoping that AirAsia could bring us to many other destinations in this region as well as other parts of the world such as direct flights coming in from China, Taiwan or even Korea.” Aireen disclosed that the inaugural flight from Pontianak to Kuching recorded a load factor of over 80 per cent passengers on board. “Within a short time of our sale, we were able to achieve that 80 per cent so I’m sure there’s a lot more we can achieve from now onwards,” she said. She added that Pontianak is one of the popular Indonesian destinations among AirAsia guests since its first flight from Kuala Lumpur to Pontianak took off in 2015. To date, the world’s best low-cost airline has flown over 120,000 guests to Pontianak and continues to see a good demand for the route. With the introduction of this route, Aireen said AirAsia can enhance fly-through options that allow guests to connect to Pontianak from Kuching and from Kuching to anywhere else in Sarawak or Malaysia. She pointed out that Kuching serves as a very important hub for AirAsia since establishing the city as the airline’s hub in 2006. “We currently operate over 468 weekly flights to and from ten destinations such as Miri, Sibu, Bintulu, Kota Kinabalu, Johor Bahru, Penang, Kota Bharu, Kuala Lumpur, Singapore and now Pontianak. To date, AirAsia has carried over 17 million guests to and from Kuching while in 2016, the airline carried more than 3.2 million guests into Kuching. chairman Datuk Abdul Wahab Aziz, and Consulate General of Indonesia in Kuching deputy chief de mission Muhammad Abdullah. To celebrate the momentous inaugural flight, AirAsia is now offering all-in-fares from as low as RM89 (one way) on www.airasia.com from now until June 18 for the travel period of June 5 to January 14, 2018.